To see all of their biographies and pictures, visit the website at www.njmmaawardds.com. This class will be honored at the Induction dinner gala to be held at the La Quinta Inns & Suites Meadowlands Hotel on December 4, 2015. 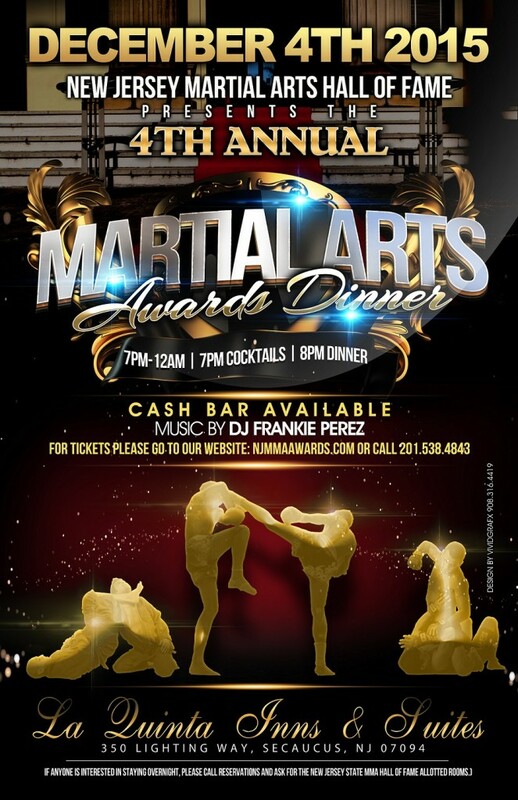 Tickets to the awards dinner can be purchased by calling 201-538-4843 or online at www.njmmaawards.com. Discount hotel room rates at La Quinta can be also obtained by calling 201-863-8700 and mentioning the Hall of Fame dinner. New Jersey has always been on the forefront of combat sports. Some of the biggest bouts in MMA, kickboxing and Muay Thai history have taken place at various venues around the state. New Jersey has had a Boxing Hall of Fame since the 1960′s. NJMAHOF’s sponsors are now recognizing and honoring those involved in combat martial arts such as Muay Thai and MMA. New Jersey is building a rich tradition in non-boxing martial arts. The goal is to recognize these individuals and entities. This entry was posted in Events and tagged Boxing, featured, kickboxing, MMA, Muay Thai, New Jersey Martial arts hall of fame. Bookmark the permalink.